Hi! If you're stopping by from the Blog Hop, WELCOME! I am happy to have you and happy to have this reason to push my writing. I tend to fall into a habit of posting once a week or every other week. When I participate in hops like this, I push through the inertia...and write. If you're new to Roaring Mama Lion, you might want to start with 13.1 Things About Me. Take a look around...I hope you like what you read! 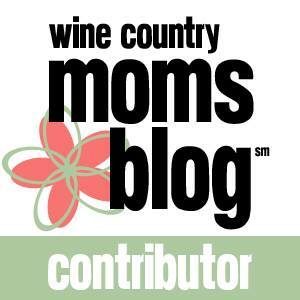 I have one other small plug - I recently started writing for Sonoma County Moms Blog - if you're not reading, you should start now ;). Come check out our little band of crazy, tired, sleepless moms trying to the best we can and maintain some semblance of sanity. This week, my best friend send me an article that is totally on point with my life right now. In the article, "It's Hard for Them, Too," the author talks about how it really is hard to be a tiny human. While the author seems to talk about a child much younger than my son, this article resonates a great deal with my life with a #fournado. I am constantly at battle with myself. When do I parent and lay down the law, place high expectations on my son and let him know that I am the mom? When do I back off and try to meet him where he is? Are those two approaches mutually exclusive? We have rushed mornings. I can't do much about this. I need my kids to sleep as late as they can, for their health and for all of our sanity. That means that we run through our morning routine at lightning speed. Otherwise known as, "I need milk. I want to wear my train jacket. Where's the book I wanted to bring? Why do I have to go to school? How many days until I don't have school anymore? What did you put in my lunch? I said I wanted peanut butter. Why did you let Sissy get dressed after me? Why...I forgot." The faster I need to leave, the slower he moves. It's a fact of nature. I thought about what he actually needs. Does he need his mommy panicking and basically throwing him into the car? Or does he need patience and grace? When I actually had time to sit and think it through, the answer felt pretty darn obvious. I stopped telling him that we need to hurry. He gets up, he runs through his morning routine. A bowl of cereal with milk and a spoon. The occasional glass of milk on the side. He gets dressed when I go get Sissy. The change did not result in miracles. I still pull up to work feeling a bit panicked. I still pray that the traffic angels will work overtime for me. We leave a smidge earlier than we used to, because morning routines in the life of a four-year-old have a bit too much SQUIRREL to move at lightning speed. 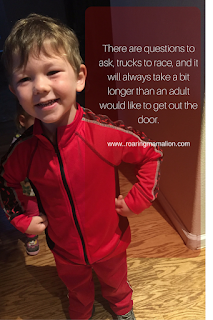 There are questions to ask, trucks to race, and it will always take a bit longer than an adult would like to get out the door. Even though I didn't gain much time in the morning, I did gain a lot. I gained my son's smiles. I gained singing in the car on the way to school, instead of whining. Wow. I need to remember this mindset with my fiancé! Definitely applicable, though his questions are a little different! Haha! Thanks for sharing! Great post! And I'm sure that it is a much more pleasant time in the car with singing and smiles too :) That seems like it is worth the bit of extra time. Songs in the car are always worth it! Nice to meet you through the hop! I think that is a great message about being where the other person is at that time, whether it's your child or your significant other. Glad your mornings are a little less hectic now! Thanks! I hope I can keep it up...it takes a while to change a habit! Great thoughts on this for parents for sure!! Thanks for linking up in the hop!!! What great advice to think about what the needs are of your child and how small changes can get the best result for both of you and with less stress! I don't have children but thinking about the needs of the other person is something that was part of my running coach training. Once you think about what your athlete needs and the best way to reach those needs the learning part becomes a bit easier (for both of you!). Oh, absolutely - I can definitely use this in the classroom. What do my students needs and when do they need it? I know all about running on child time, and how slow it can be...I have two kids also. It sounds like you figured out a good compromise - leave a little earlier and stop rushing him. And yes, the smiles make it worth the wait. They live in their own worlds, that's for sure! I love the small views into his world that I get, and I want to encourage him to stay there as long as possible. It is great to meet you through this blog hop! I def needed to hear this advice today, as the mornings are always a stressful time trying to get 2 littles out the door and dropped off in opposite directions and then to work on time...I def need to stop portraying my anxiety that we are going to be late on them! I'm glad to help! I have pretty much the same routine - two kids, opposite directions, and work far opposite of that. It's a bit of a panic, but breathing and letting to a bit has helped a lot! I know that my mom feels the same way, and she only had one of me to rush around! It's a stressful time, but I WANTED this so much...I never want my son to feel like he's a nuisance! Awesome gains with your son! Thank you! I'll take them where I can! Oh I have a slow mover she's now 12 and unless it involves friends. You're right the more you let them know how slow they're going, how hurried you are or you'll be late. They go just a tad bit slower. Sometimes you have to go with it or prep for it but looks like you're navigating the multiple personalities of multiple tiny people well. Kudos, Mom! I never really understood how different two kids from the same parents could be, but yeah, two tiny humans with very different views on life! Thanks for stopping by! Zen...that would be nice! I'm trying! Nice mindset! It always helps to see everything in a different light. I would definitely use this tip in future. Glad to know you through the hop! Thanks for stopping by! Yeah, that change in perspective takes a bit of effort on my part, but it's so worth it. My daughter was always the same way when she was younger. This year, she turned 6, and has improved significantly! Although, I will admit that I am the one that leaves the house first in the morning. So, if there are any fights over clothes, breakfast, etc., it is on my hubby. Yeah, my husband leaves an hour or so before us - he doesn't usually see the morning routine, and it definitely boggles him on the weekends! I grew up in a simpler place and time, rural Jamaica in the 1980s. Things were so much different so I have compassion for kids today who have way different and probably more challenges growing in the 2010s. You're right. It's hard for them too. There are times that packing up and moving to the country for a different pace of life sounds incredible! This is the daily struggle in my house. I try to be patient and help her along as much as I can but sometimes it's hard. When I'm having a bad morning I try to remember she's only 6 and it's not going to last forever. I'd rather she has good memories of a smiling mommy than a rushed, upset mommy. Thanks for the reminder to be more patient!